To help promote their honey and bee sales, the CHC has started to compile 2 databases. The first database is to help promote interprovincial and international honey sales. It is a list that will be posted on the CHC website, used to promote honey and bee sales and will be taken for distribution to international trade missions. The second database will be used to promote interprovincial bee sales. 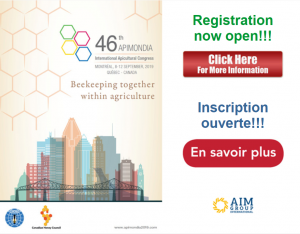 Any Canadian beekeeper who belongs to a provincial association and meets the requirements can be part of these databases. The minimum requirement for honey sales is 1 shipping container of honey to be potentially sold internationally/interprovincially, and CFIA registration. For bee sales it is 50 queens and/or 50 packages and/or 50 nucs. If you are not on the databases, but wish to be included please contact Rod Scarlett (chc-ccm@honeycouncil.ca).